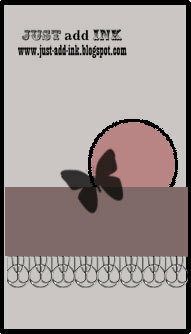 and heres what I came up with. This card is a crayon resist technique card that Im providing for my monthly Team training this Sunday. and hope you come and play with us this week at Just Add Ink. Delys this is one super duper gorgeous card. I love everything about it right down to the pearls you’ve used to finish! What a glorious card, Delys. I love the colours you’ve used and all the texture! 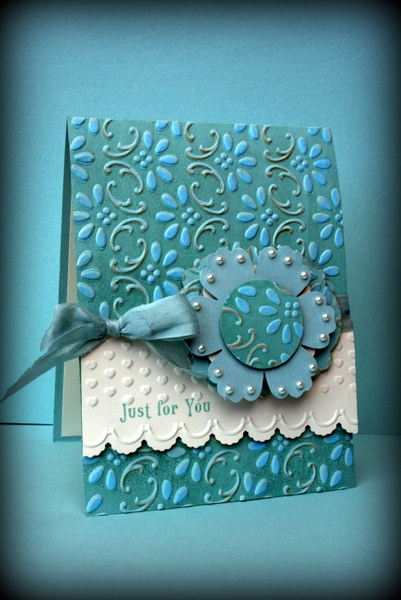 I love how this technique has put so many shades of blue on your card and really highlighted the textures. Love it! Wow – stunning! What a fabulous technique, Delys. Love this card! These colours are stunning together Delys! And, I love all the different textures too. Very clever and inspiring! This is absolutely gorgeous. 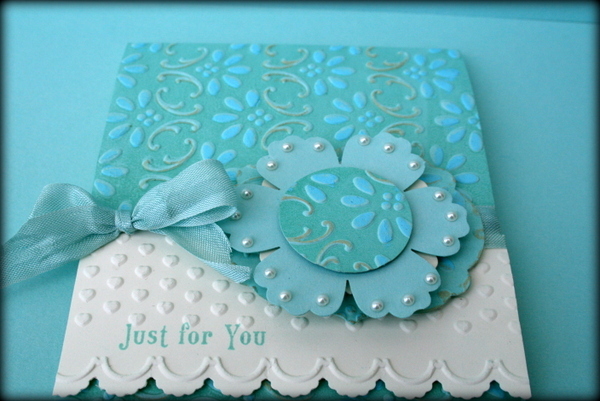 I love the colours and textures you’ve created with the embossing folder. I also love how you’ve embellished the flower. I’m still trying to work out exactly how you did this Delys. But it will be worth thinking about because the end result is stunning! Love the combined effect of embossing and colour variations. Hi Sharon, Thanks for commenting and following..Didnt realise I hadnt shown how to do this so have popped up the tutorial in my free tutorial sections..any questions just ask! sorry its confusing, its hard to describe. You emboss your cs as normal, open up the embossing folder but dont move or take the embossed cs out. Colour all the raised bits of the embossed cs and brayer ink over the open debossed side of the folder. Pop back into your embossing machine and voila all done. Its important not to move the cs after its been embossed so thats why I use post it notes or washi tape to hold it in place, while I colour. I used watercolour pastel crayons. A white crayon looks stunning on a dark cs too.